Should You Get Out of Oplink Communications Before Next Quarter? There's no foolproof way to know the future for Oplink Communications (Nasdaq: OPLK) or any other company. However, certain clues may help you see potential stumbles before they happen -- and before your stock craters as a result. Rest assured: Even if you're not monitoring these metrics, short-sellers are. I often use accounts receivable (AR) and days sales outstanding (DSO) to judge a company's current health and future prospects. It's an important step in separating the pretenders from the market's best stocks. Alone, AR (the amount of money owed the company) and DSO (days' worth of sales owed to the company) don't tell you much. However, by considering the trends in AR and DSO, you can sometimes get a window onto the future. Sometimes, problems with AR or DSO simply indicate a change in the business (like an acquisition), or lax collections. However, if AR grows more quickly than revenue or DSO balloons, that can also suggest a desperate company that's trying to boost sales by giving its customers overly generous payment terms. Or it can indicate that the company sprinted to book a load of sales at the end of the quarter, the way used-car dealers do on the 29th of the month. Sometimes, companies do both. Why might an upstanding company such as Oplink Communications do this? For the same reason any other company might: to make the numbers. Investors don't like revenue shortfalls, and employees don't like reporting them to their superiors. Differences in business models can generate variations in DSO, so don't consider this the final word -- just a way to add some context to the numbers. 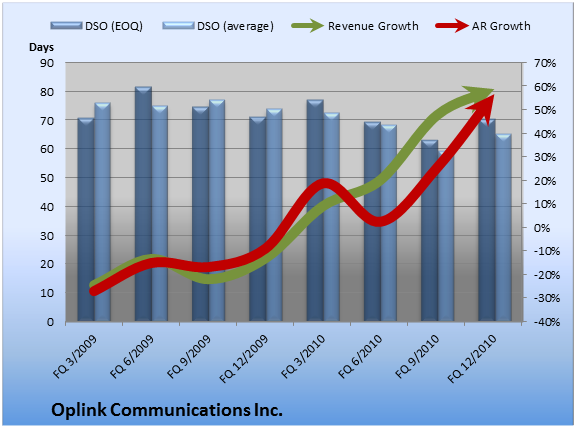 But let's get back to our original question: Will Oplink Communications miss its numbers in the next quarter or two? The numbers don't paint a clear picture. For the last fully reported fiscal quarter, Oplink's year-over-year revenue grew by 58.9%, and its AR grew by 57.0%. That looks OK. End-of-quarter DSO decreased by 1.2% from the prior-year quarter and rose by 11.2% versus the most recent quarter. That demands a good explanation. Still, I'm no fortune-teller, and these are just numbers. Investors who put their money on the line always need to dig into the filings for the root causes and draw their own conclusions. I use this kind of analysis to figure out which investments I need to watch more closely as I hunt for the market's best returns. However, some investors actively seek out companies on the wrong side of AR trends to sell them short and profit when they eventually fall. Which way would you play this one? Let us know in the comments section below, or keep up with the stocks mentioned in this article by tracking them in our free watchlist service, My Watchlist. Add Finisar to My Watchlist. Add JDS Uniphase to My Watchlist. Add Harmonic to My Watchlist.